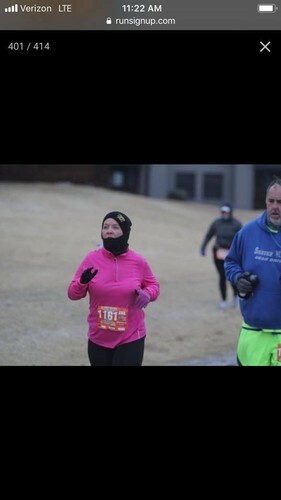 Jan 19: The Go Short, Go Long, Go Very Long race in Tulsa, Oklahoma. Oklahoma is known for hot, hot summers and fairly mild winters. However, on occasion winters here can get out of hand. That day was one such day. We woke up to 26 degrees, with winds at 40mph gusting, ice on the trail and zero sunshine. All in all, it was pretty awful. I was nervous about the race because it was so cold and there was ice. We started out the race, and I went quite slow due to the ice. I was able to pick it up a bit on the back half, when I tucked in behind 2 people who were pacing well. The wind was serious, and blew a couple people over. When combined with the ice, I was surprised that the race went off as well as it did. The race was multi-distance, and there were a fair number of 25K and 50K runners as well. I was simply not brave enough to join that particular crowd!